The most common access control project size is 5 - 16 doors per project. This 2018 result mirrors previous statistics, most recently in 2016 where the category ranked ~50% of responses. This size encompasses most commercial systems. 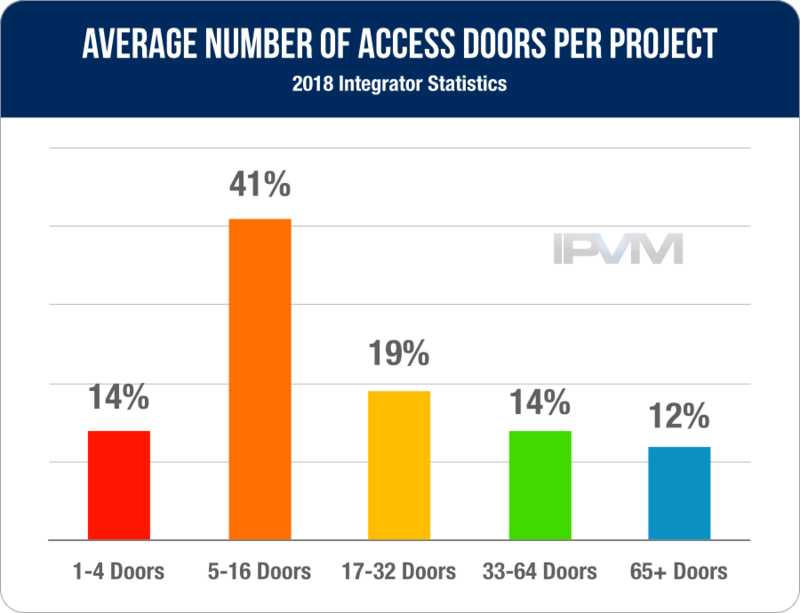 This distribution shows the peak at 5 - 16 doors, typically smaller systems controlling a few security-critical doors in a single commercial property, while one-quarter of projects are in the 'large' project category of 33 doors or more. From a pragmatic standpoint, why are access projects smaller? In contrast to video surveillance, typically running Average Number of Cameras Per Project where most deploy between 17 - 32 per job, this result shows access control is deployed less frequently. In the sections that follow, we examine each in depth. "Customer resistance to upgrading. They seemed more inclined to keep it going even if it is not as functional as newer systems or it starts to require more maintenance. Seems harder for customer's to get authorization to replace from the powers that be compared to other systems." "Presenting the initial costs associated with a forklift upgrade and give a client sticker shock"
"Takeovers. Customers think takeovers should be easy and inexpensive. The opposite is true. Takeovers are often more difficult then a new install." "Live system conversions. Setting Customer expectations about the level of effort and potential for issues can be difficult. Keeping the existing system live and performing cutovers on a reader-by-reader basis is laborious and results in prohibitive costs for the Customer. Conversely, it's not acceptable to take down groups of readers in one fell swoop for a wholesale up-lift." "Upgrading existing systems and explaining features and benefits associated with increased cost." "Biggest problem is upgrading existing systems and explaining features and benefits associated with increased cost." "Mostly, it's the failure of the client to handle their tasks. No lists, no access groups, they don't put all the right people in the room for training...they just seem to prioritize video." "Some customers want access control, but arent sure about the point of it." "There are so many fast and cheap solutions on the market now and trunk-slammers or corporate integrators that have low standards of quality that customers don't always see the value in top notch solutions until after the bidding process." "If I had to identify a problem I would say it is getting the customers to approve the budget for access control. Some people just don't see the value in having access control on certain doors." "They compare to getting a lock rekeyed and can not justify the expense. Once you educate them on the benefits of being able to log who enters, restrict entrance, and instantaneously block access, many realize the upside to electronic access control. If you keep it a pricing response, you will always lose to the locksmith." "End users have difficulty to understand the importance of the access control system. We also find it hard to explain the importance of high quality locks and door mechanisms. " "We'd like to bring in more functionality but users generally just want to swipe and open a door." "The customer is not aware of all the rules and regulations. If I provide them with what that ask for, the contracting officer can point to the line that says I need to be in compliance with pertinent regulations. If I follow the regulations, then I am over priced and I don't win the award. " "Every door is different. Access control can go very quickly but if you get hung up on something it can also be very time-consuming. We work in a lot of old buildings where door frames are often not straight. New construction we zip in and out easy." "Picking the right type of electronic locking mechanism for the door/frame. This is the trickiest part of any access control project." "I feel that the nerds screwed the market up and muck it up with there b.s. about IT stuff." A full analysis of integrator voted 'Favorites' and 'Worst' systems are coming next week, where we analyze votes and report which market segments platforms are used, which ones are avoided, usage based on project size, performance limitations, and other business factors. We asked this question in 2014 and 2016 note, and the results were similar, although differences can be seen in the higher end of the market. The number of large 'large' (33 or more doors) is less pronounced, signaling a likely overall increase in smaller project opportunities.